I recently got hold of the new Dark Angels book and decided to try out making a Deathwing-heavy force to use for the next 40K league. 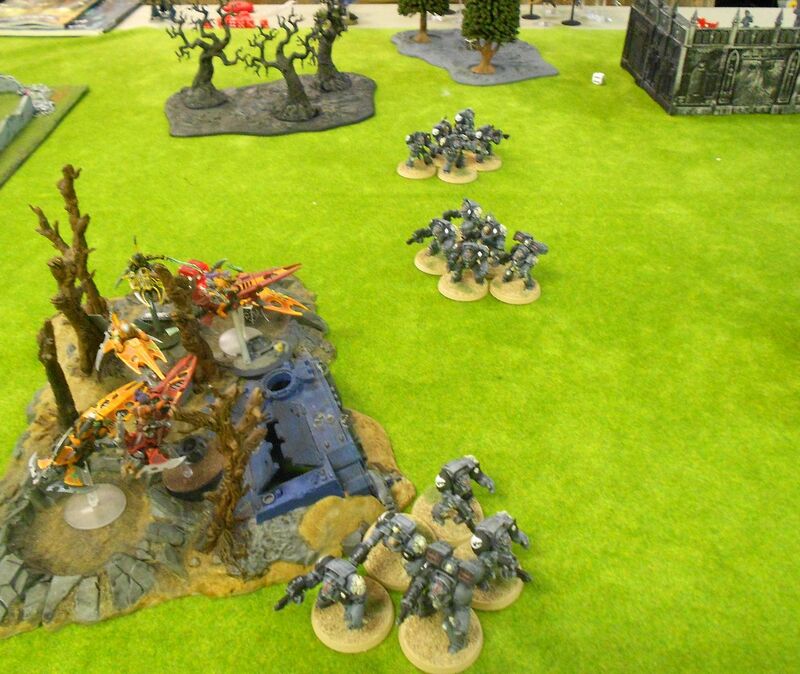 For the first round of games at 1000pts, the army consists of Belial (with twin claws, what I currently have modeled), three terminator squads and with the leftover points, a five-man tac squad with flamer. 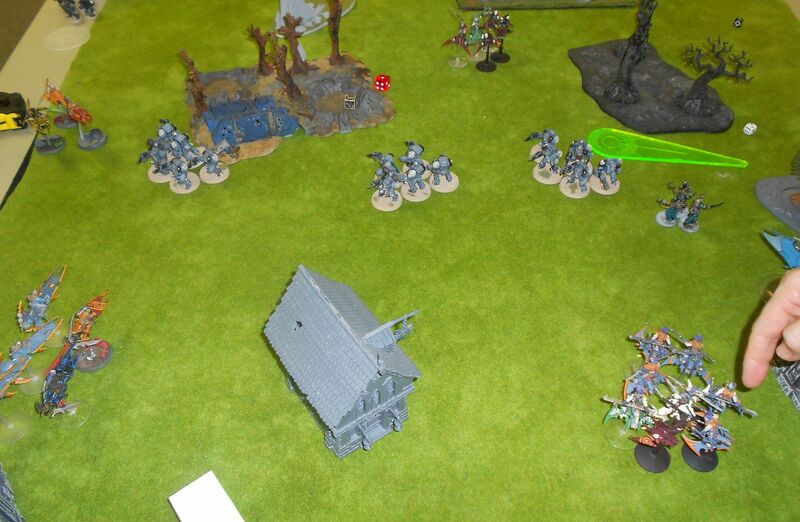 At Gaming Underground Sunday I got a practice game in with Jim Bowen's Dark Eldar. He took a very mobile force - three squads of hellions with the Baron, two squads of bikes and a small wrack unit in a venom. We rolled up Big Guns Never Tire, which basically meant we played Crusade since neither of us had any Heavy Support units! 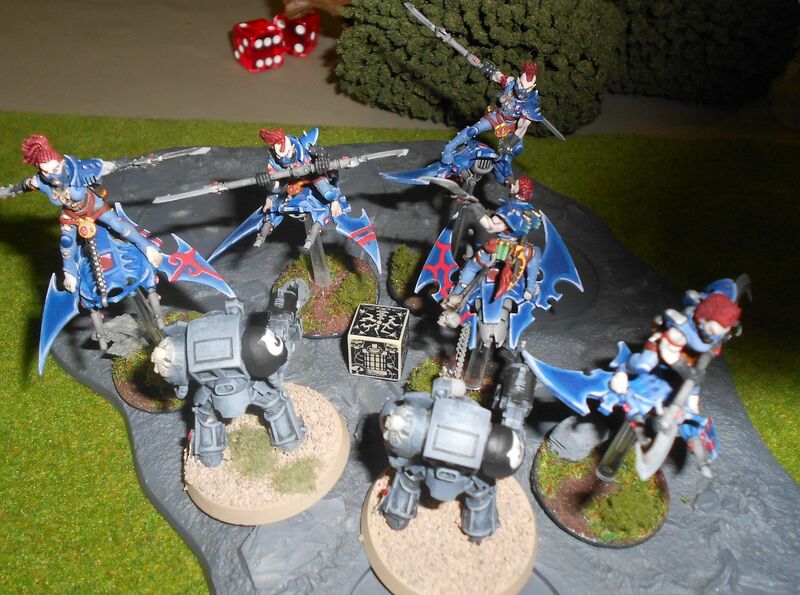 Above are my tac squad and Belial hanging out by one objective. 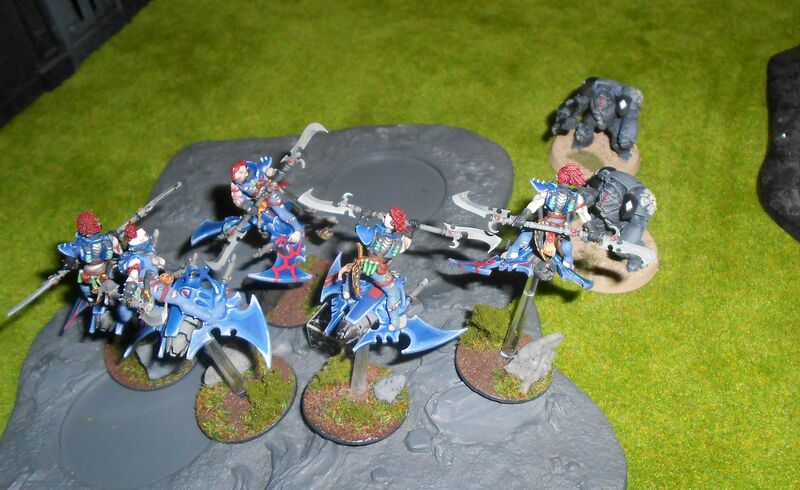 To start things out, a biker squad boosts over the Sharks, using bladevanes and cluster caltrops to rack up the wounds. Many failed saves later, the marines are wiped out! Good thing I elected to have the Deathwing Assault on turn one, otherwise I'd have lost right here! 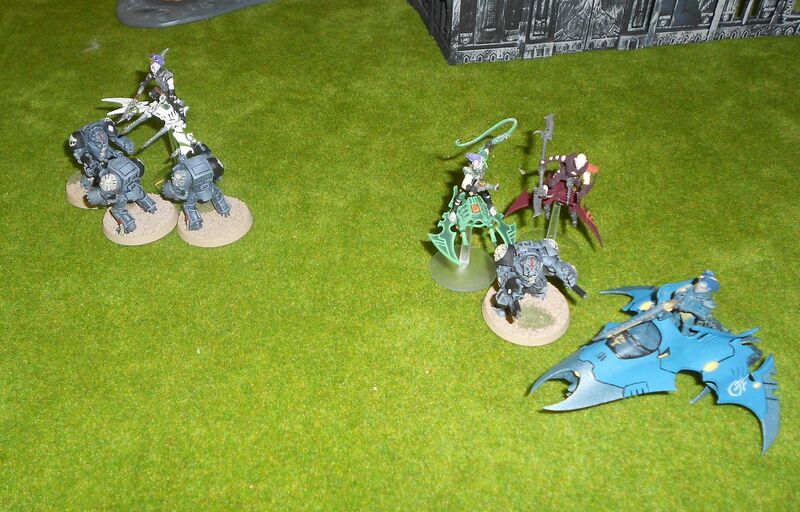 Even so, First Blood, Slay the Warlord and two pain tokens make for a very satisfying first turn for the xenos. Certainly an uphill battle from here! VOOMP! 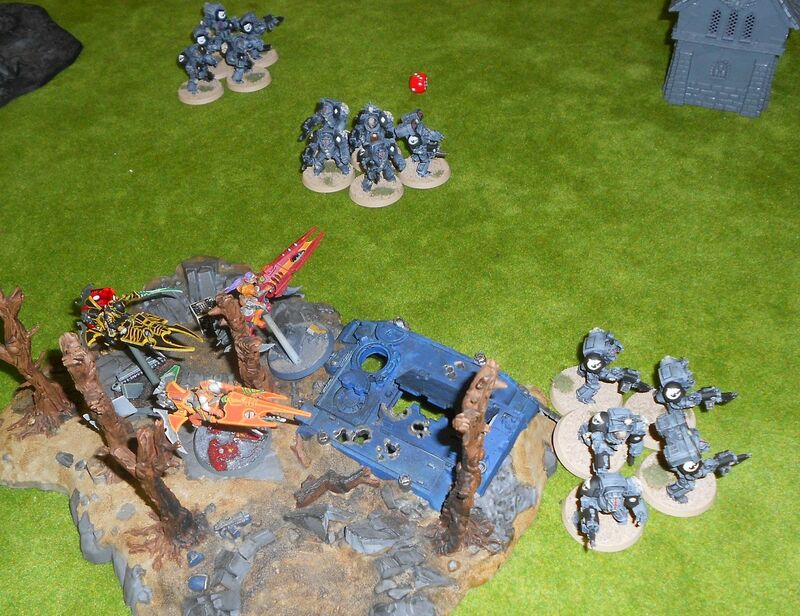 The warp crackles and spits out a host of heavily armored warriors summoned by their downed comrades. They open up on various units, killing a few foes but not finishing any off. The ability of the DW squads to Split Fire is pretty cool. 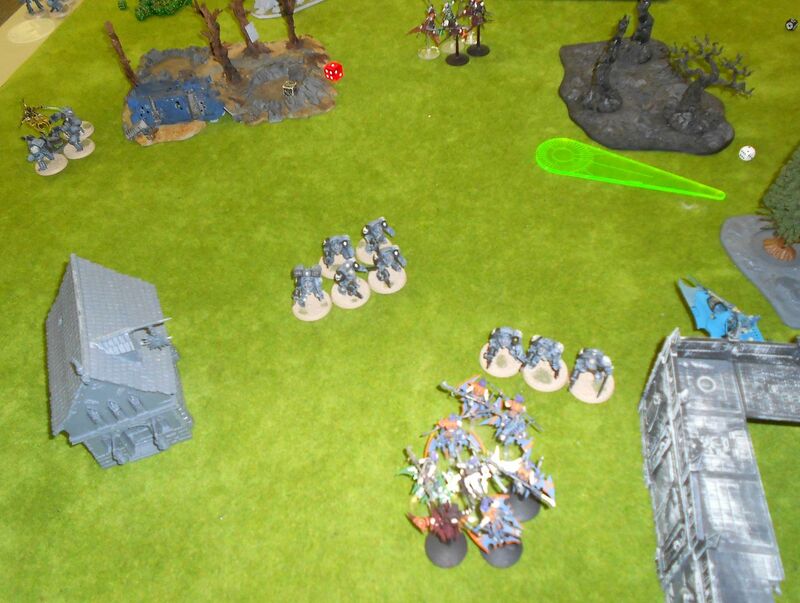 Hellions start arriving, bikers move up, and wracks disembark from their venom, surrounding the terminators. Just the sort of situation terminators dream of. The wracks' liquifier rolls up AP2, but fortunately only gets two wounds, both of which are blocked by invulnerable saves. Other shots pick off some sharks. Small biker squad charges one squad of termies, wracks charge another, but the sharks come out on top. Space Sharks move in on the Baron's squad and pepper it with frag missile and stormbolter fire. Most of the hellions are blown apart, and the Baron takes the few survivors and flees ahead of sea of powerfists. Chainfist takes down the venom, but Baron and his buddies return. 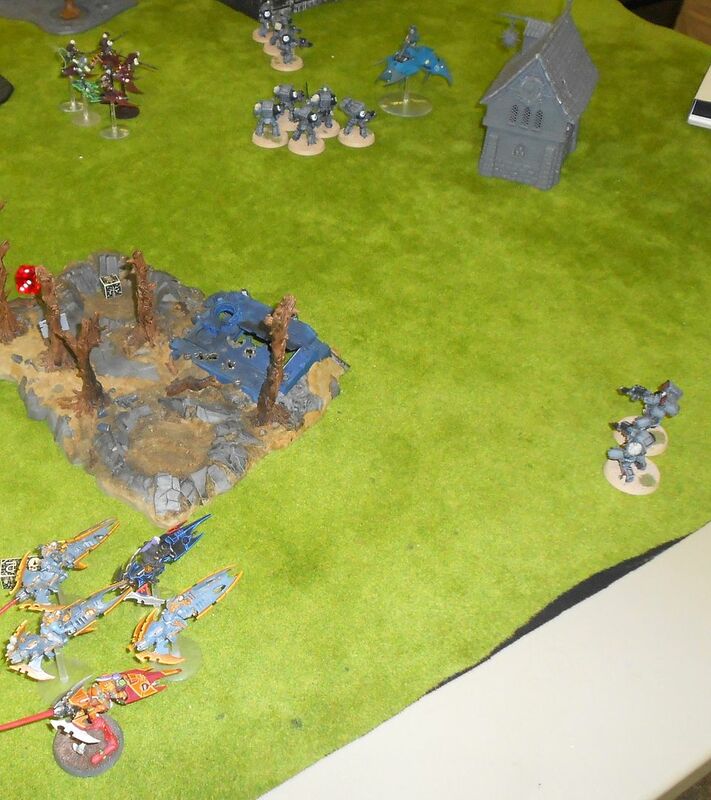 Eventually the chainfist termie falls leaving one hellion alive, while the Baron finally fails a shadowfield save and repaints his skyboard a deep, if irregular, red pattern. Two surviving terminators! 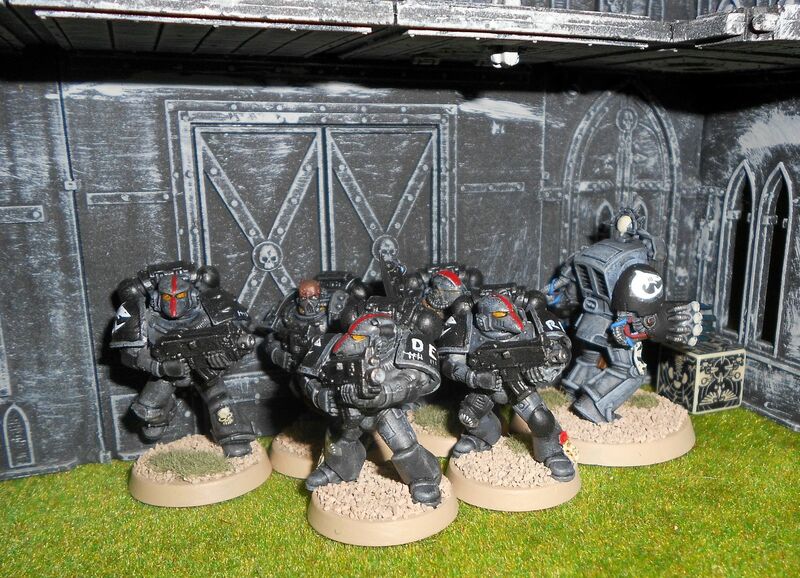 Fresh from killing the Baron, they close in on a hellion squad squatting on an objective. Storm bolter shots are ineffective, as the hellions have taken refuge in an ironbark forest and are sitting on an activated scatterfield, netting them a comfy 2+ cover save. CHARGE! 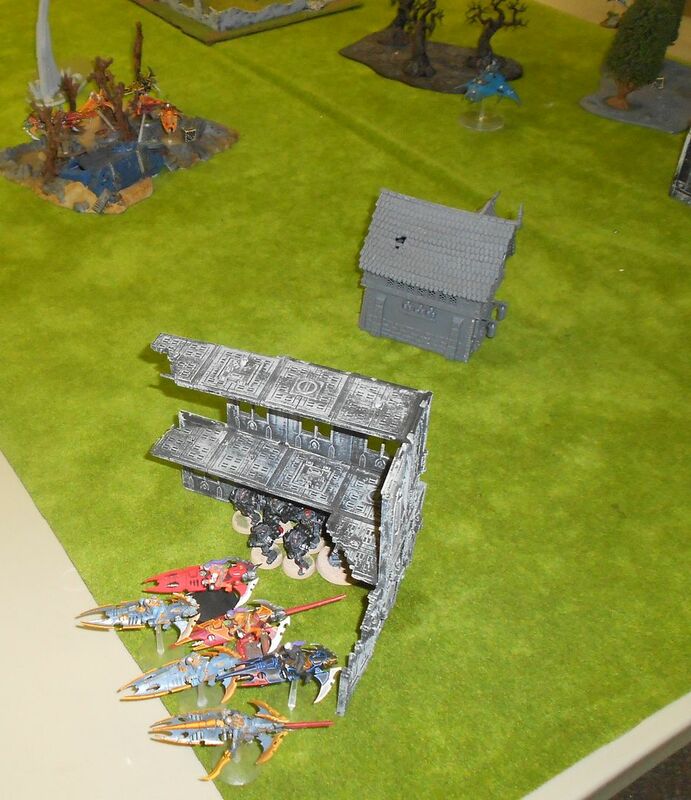 The Space Sharks make it in to the hellions, kill three and run the others off. The game ends, and actually results in a tie! After that horrible start, I expected to get wiped out. 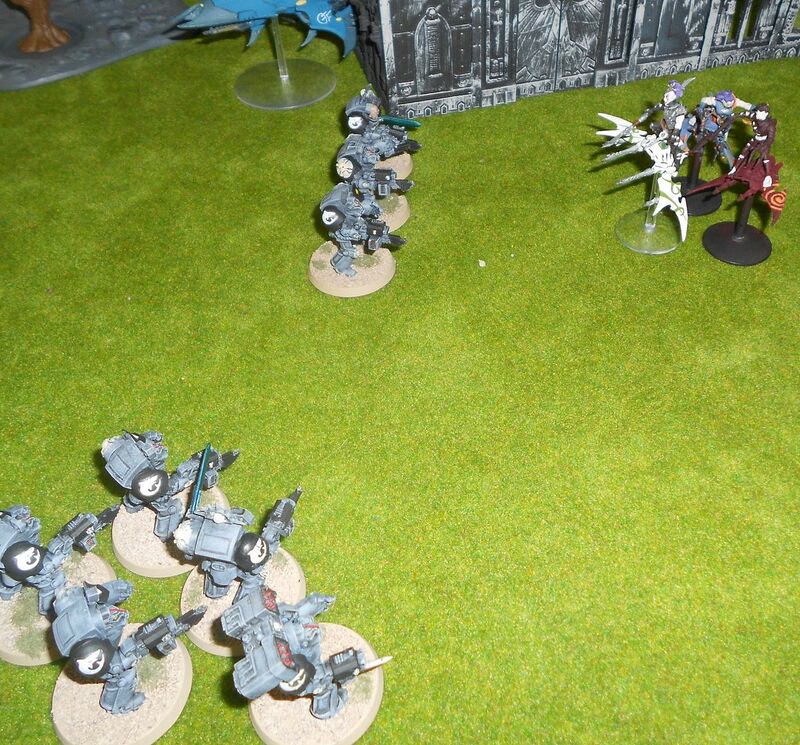 It came close to that, but the termies slogged through it all with determination. My last two guys held one objective, I had slay the warlord and linebreaker, while the DE held another objective with a couple of surviving hellions and had first blood and slay the warlord, for 5VP each. 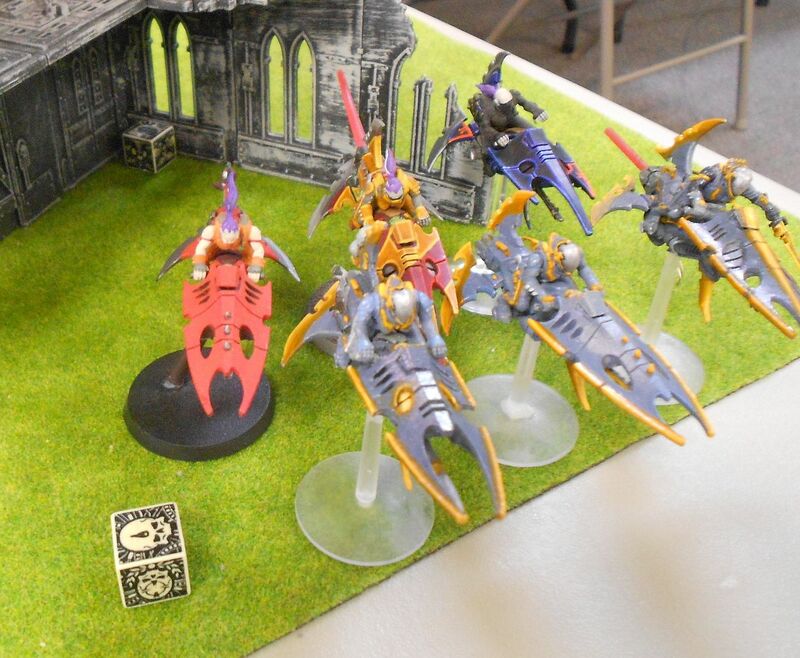 From what I can recall, one of the few actual draws I've seen in 6th edition. Woof. Fun game, some crazy rolls on both sides. Neat playing with two very different armies. 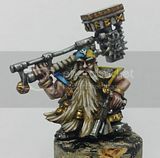 If Jim takes the same army and I play him in the league, I'll have to remember to keep my starting squad on the actual board edge to limit flyovers! WIP Eldar and BONES BONES BONES!